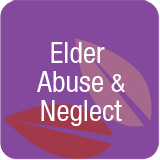 Elder Abuse and Neglect – Elder abuse and self- neglect become a common occurrence as our population ages. Older adults are more frequently abused by adult children, spouses, other family or individuals they view as trustworthy versus a stranger. Older adults who experience isolation, depression or memory loss practice self -neglect when they fail to care for themselves as compared to another individual acting in their own best interest. How can we identify those unable to care for themselves and provide support without being suspect of undue influence?